Density logs first appeared in 1957, based on the principle of gamma ray absorption by Compton scattering. Early tools were called gamma - gamma density logs because they emitted and recorded gamma rays. The log displayed counts per second, which was transformed to density by a semi-logarithmic transform. Modern tools have two detectors, which allows borehole compensation to be applied. They are scaled in units of density (grams / cc or Kilograms / cubic meter). Some density logs also record photoelectric capture cross section which is useful in lithology analysis. Some density logs are displayed in porosity units (percent or decimal fraction). The gamma ray source foe all tools is cesium 137. 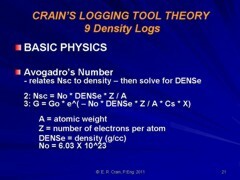 For more detail on the physics of the density log measurement, see Density Theory. The tool can be used in air or mud filled open boreholes. A cased hole tool is available in some areas. Early density logs run by the major service companies had only one detector and were recorded in counts per second. There were no automatic borehole corrections as there is today and calibration to density or porosity took some effort. Such logs are still in widespread use in mineral exploration and resource assessment. The USGS, NRC, and a number of independent service companies run slim hole density logs of this design. I ran a set on Melville Island in the Canadian Arctic in 1969 for sulphur exploration. Aside from trying to stay warm and keep the liquid ink recorder from freezing up, everything ran smoothly for 4 months before returning to gentler climates. Density is derived with a semi-logarithmic transform. 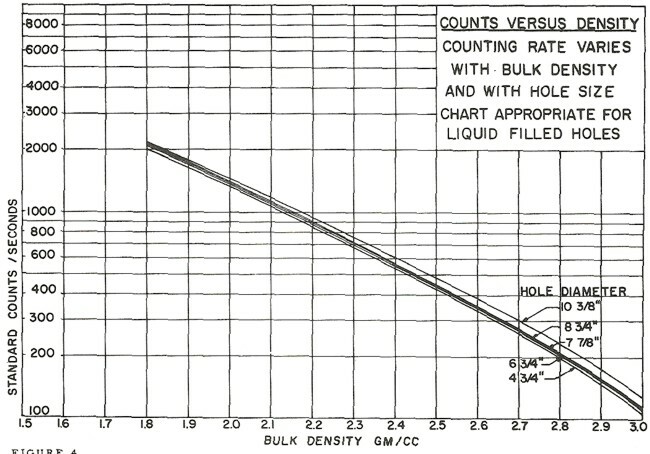 If no appropriate tool specific chart is available the High Low porosity technique as described for the neutron log is used. Here, high count rate = low density = high porosity. Semi-log crossplots of count rate versus core density or core porosity will calibrate the method. These tools have a single detector and are not compensated for borehole effects. Slim hole versions were widely used in strat holes and in mineral exploration projects. Charts for some specific tools can be found in the literature, such as the one shown below. The uncompensated density log produces a single log curve scaled in counts per second. Some independent logging contractors can provide a log scaled in porosity or density units. Some tools were run with a gamma ray log. Single detector density tools are severely affected by hole size, mud weight, mud cake thickness, source type and strength, source detector spacing, and detector efficiency. The High-Low calibration method compensates for all these problems, but available charts do not. In the earliest versions of these tools, the source strength decayed rapidly, so count rates definitely need to be normalized on a well by well basis. The borehole compensated formation density logging tool emits gamma rays from a chemical source at the bottom of the tool The gamma rays enter the surrounding rocks where some are absorbed. Some gamma rays survive to reach scintillation counters mounted about 18 and 24 inches above the source. The number of gamma rays arriving at the far detector is inversely proportional to the electron density of the rock, which in turn is proportional to the actual rock density. Data from the closer detector is used to correct for borehole effects. Porosity can be derived from density and can be presented as a percent or as a decimal fraction on the log. This porosity may still contain artifacts from shale and minerals not accounted for by the logging computer, so this porosity is NOT a final answer. A typical density logging tool is shown at the right. The tool is pressed against one side of the borehole by a back-up arm that also serves to measure a diameter of the borehole. Two detectors at fixed spacings from the source are shown. The source is well-shielded from the two detectors and only scattered gamma radiation is detected. The intensity of the scattered radiation will be dominated by the density variations along the path from source to detector. If there is no stand-off (of mud or mudcake) between the tool face and the formation, and if the tool is properly calibrated, then the apparent density from both detectors will be the same and equal to the true formation density. If they are different, there must be mud between the tool face and the rock. If there is some standoff, a correction to the density from the long spaced detector can be generated from the difference between the apparent density seen by the far and the near detectors. The actual correction function can be determined empirically by placing the density device in a number of formations to measure the apparent long-spaced and short-spaced densities for various thicknesses of mudcake of a variety of densities. Computer modeling has augmented these laboratory studies. In addition to the density and optional porosity curves, a caliper and gamma ray curve are also presented, along with the density correction curve. Note that the correction has already been applied to the recorded density data by the computer in the logging truck. The litho density logging tool and the log display look very similar to the older version, except for the addition of one new log curve, the photo electric effect (PE or PEF). The energy of the returning gamma rays is a function of the PEF of the rock, which is indicative of mineralogy. To measure PEF, the detectors were changed to measure both gamma ray count rates for the density measurement and also the gamma ray energy levels for the PEF measurement. Most modern two-detector density devices use multiple energy windows to derive the density, the photoelectric factor, and the correction curve. 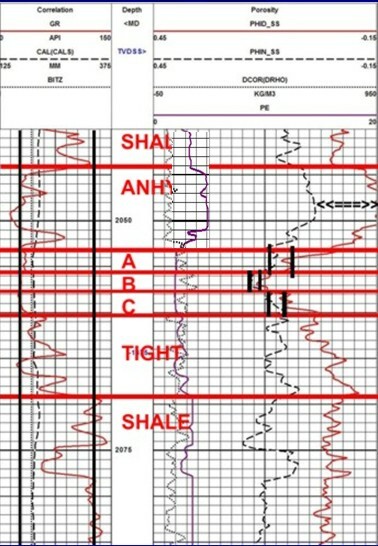 In one three-detector wireline version, the combination of multiple detectors and multiple energy windows produce on the order of a dozen counting rate measurements at each depth. Each counting rate can be described by a forward model relating the rate to the five important parameters of density logging: formation density, formation photoelectric factor, mudcake density, mudcake photoelectric factor, and the thickness of the mudcake. For more detail on the physics of the PEF measurement, see Density Theory. The log curves presented are the same as the older FDC log, with the PEF added. Standoff caused by rough or large borehole leads to useless density data if the problem is severe enough. The density correction curve, the caliper curve, and the density curve itself help to flag these intervals. Because the backup arm exerts considerable pressure, mudcake thickness is not usually an issue, but that same pressure forces the measuring skid into the large diameter of an oval borehole. This occurs in stressed regions. The large diameter has the worst borehole condition so we get the worst possible density log. In the mid 1970's a 90 degree offset tool was developed to reduce the chance of logging the large diameter of the borehole. It consisted of a second backup arm at 90 degrees to the original, pressured a little higher, that forced the tool skid into the smaller diameter. This led to the concept of the dual axis, or X and Y axis calipers. 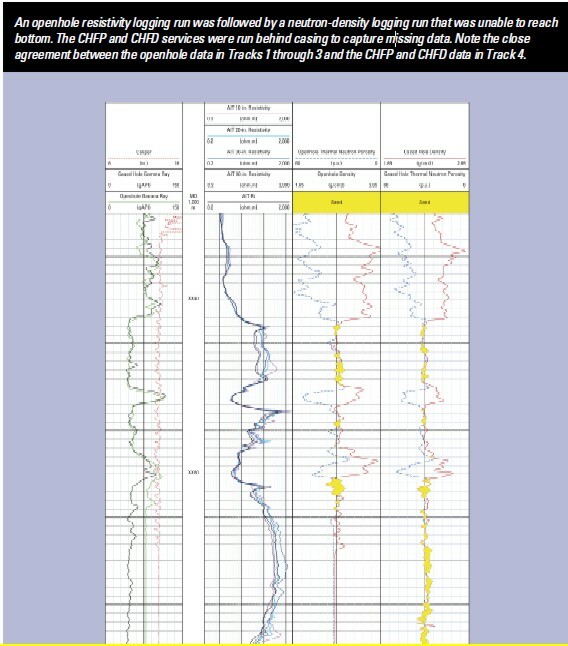 Later development led to a dual density tool, essentially two complete density logs on the same tool string, positioned at 90 degrees from each other, resulting in reasonable complete log coverage in stressed boreholes. CAUTION: Do not use density data when you suspect standoff problems. A reasonable guide would be a density correction more than 0.15 gm/cc (150 kg/m3) is highly suspect and greater than 0.20 gm/cc is useless. If density porosity is greater than neutron porosity, and no gas is expected in the rock, the density is probably useless (provided the logs were run on a porosity scale appropriate for the mineralogy). Noisy, hashy, or impossibly high density porosity probably indicates a bad log, even when the caliper and correction curve show no problems. The density skid is about 2 feet long so there can be significant breakouts within that distance that the caliper cannot see. Some areas are heavily stressed and stress release during drilling causes oval boreholes or large breakouts in the maximum stress axis of the borehole. The skid and backup arm of the density log often end up in this axis so we end up logging the bad side of the borehole. Another strong-arm caliper set at 90 degrees to the density caliper forces the density skid into the good side of the borehole, resulting in better log quality. Some operators ran several logging passes in an effort to get the 90 degree offset tool to log most of the interval on the good side of the hole. The 90 degree technique is still used but doesn't always succeed. An alternative was called the dual density log. There were literally two density tools coupled together, one above the other at 90 degrees so that while one tool was facing the bad side of the borehole, the other was facing the good side. Thus two independent density logs were run simultaneously. During data processing, the computer code was adapted to take the maximum of the two density corves, eliminating most of the bad data. Cable torque forces the tool set to rotate in a stepwise fashion as it travels up the borehole. There may be minor bad hole effects at these spots. I am not sure such a combo could be run today. Density is proportional to porosity, shale content, and matrix rock type, just as for the sonic log. Both are also affected by the fluid in the formation and both must be run in a liquid filled borehole, although the liquid does not have to conduct electricity. limestone scale (dashed line), and density correction, plus gamma ray and caliper in Track 1. The density log can be presented in units of density, that is, grams per cc or Kilograms per cubic meter. Some log presentations portray the density data as its equivalent porosity, translated with a particular lithology assumption. Some show both density and density porosity, as in the image above. Because some logs do not have a density scale, you may have to translate the recorded log into density units so that it can be used, for example to calculate acoustic impedance for a seismic application. To use data from a density log, you must correctly identify both the scale type, lithology assumption, and the two end point values. Other log curves are often present, such as the density correction, compensated neutron, gamma ray, caliper, bit size, cable tension, and photoelectric effect. You have to choose the correct curve from among those presented. Editing for bad hole and casing effects will be mandatory if the log is to be used to generate a synthetic seismogram. The density data should not be used for any purpose if the density correct is larger than 0.200 gm/cc (200 kg/m3). CAUTION: The use of an inappropriate porosity scale on a combination density - neutron log presentation can be EXTREMELY misleading. For example, sandstone rock recorded on a limestone scale will cause the density porosity to be higher than the neutron porosity by as much as 6 to 8% (0.06 to 0.08 decimal fraction). This is often interpreted to indicate the presence of gas, leading to very expensive completion mistakes. The density - neutron crossover needs to be considerably greater than 8% to indicate gas in this situation. Similarly, a log run on dolomite scale through a limestone rock will show up to 12% porosity crossover, just because of the inappropriate scale, not because of gas. Use the PE curve to determine lithology, then interpret the crossover correctly. PE near 2 = sandstone, PE near 3 = dolomite, PE near 5 = limestone. Density interface logs are used to look for fluid interfaces in gas storage caverns. Such caverns are created on purpose in salt beds to store natural gas near points of demand to help meet peak loads. You don't need a very sophisticated or well calibrated tool to do this. A single detector tool recording its response in counts per second (cps) will do the job. They can be run on slick line with a memory device or on wireline in real time. The logs may be non-standard in presentation and may not be recorded in digital files in LAS format. During the initial mechanical interface test (MIT) of a gas storage cavern, the survey is run in time-lapse mode. With some water in the cavern, nitrogen is injected under pressure and held for at least 24 hours. If the water level changes or pressure drops more than 10 psi, the test has failed. Remedial action, if possible, must be undertaken before the cavern can be used to store gas. During operation of the cavern, the objective is to observe the water--gas contact depth in the cavern, along with the reservoir pressure, to monitor remaining gas volume. The original cavern volume is determined by a sonar log. This device maps the travel time of sound from the tool to the cavern wall and back again. By pinging the sonar in varying directions, a map of the distance to the walls can be made at various depths in the cavern. The survey ends up as a 3-D image of the cavern, which is used for routine gas volume modeling. Logging while drilling (LWD) offers many alternatives that can be displayed as an image log. 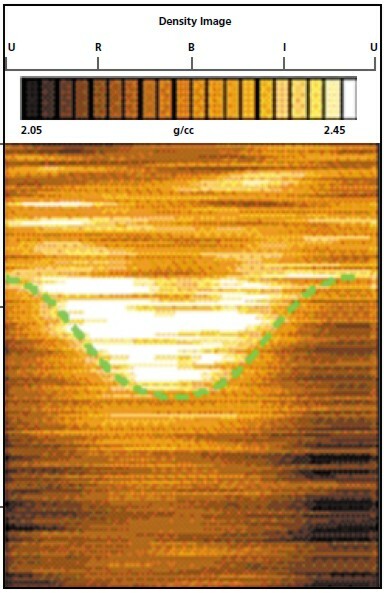 The example at right is a density image log. Low density values are shaded dark and can be interpreted as porosity or shale. A gamma ray log run with the drill string helps distinguish between these alternatives. White colours represent low porosity or tight rocks. The LWD density tool is a focused source and detector set, similar in concept to an open hole density logging tool. As it rotates, it scans the borehole wall to form the image. Data is stored in memory downhole, while only the composite density curve is sent uphole, where it is displayed in standard well log format along with any other LWD curves available in the tool string. This log was often presented on the same log display as the compensated neutron log, and more rarely in the right hand track on a dual induction log.